Morning Fire Destroys Seven Oaks Home, SEVEN OAKS, April 17, 2008 - During the 10 o'clock hour of Thursday morning, April 17th, 2008, a fire destroyed a home that was located off of Highway 59 North in Seven Oaks. 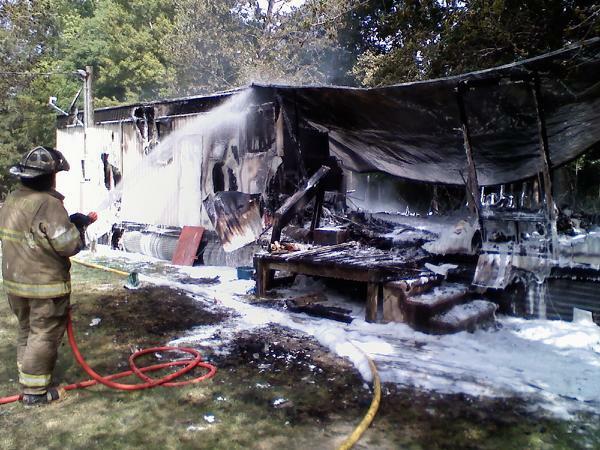 The home was a mobile home owned by Ruthie Ford of Seven Oaks. The home was a total loss. 1 pumper truck and 2 tankers from Livingston Volunteer Fire Department and 3 trucks from Corrigan Volunteer Fire Department and a host of volunteer firemen were dispatched to the scene to put out the blaze. Sadly, Mrs. Ford had no insurance. Ruthie Ford had no insurance.